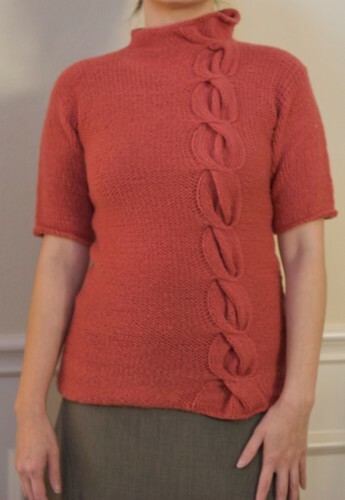 Notes: My instinct was to knit this in the round, but I went ahead and constructed it mostly as instructed. 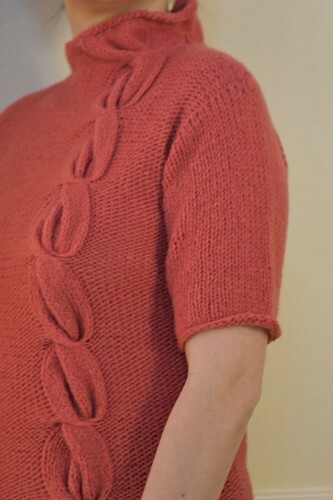 The intention was to knit the body in one piece, starting with the bottom edge of the front and ending with the bottom edge of the back. Once I got to the neck section, I did change things up a bit by leaving the neck stitches for the front live on a holder and doing a provisional cast on for the back neck stitches. After finishing the body, I went back to the neck stitches and knit them all at once, in the round. 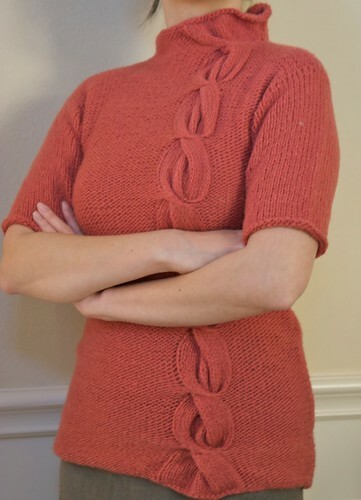 In retrospect, it would have been easier to have knit the whole body in the round. This is particularly true if you have a different gauge (as I did), because then you don’t have to do calculations to ensure that the cables on the front and back end at the same place. 4”x4”, so I had to made adjustments accordingly. Note that the schematic seems to show the wrong width numbers. The neck has some wonkiness to it because of the mixture of stockinette and reverse stockinette. Personally, I like it, but if you don’t, you might consider doing it differently. What sold me on this design was, of course, the cable. It is really lovely and fun to do! I especialy love how it results in extra little folds in the cable. Totally makes it worth it.